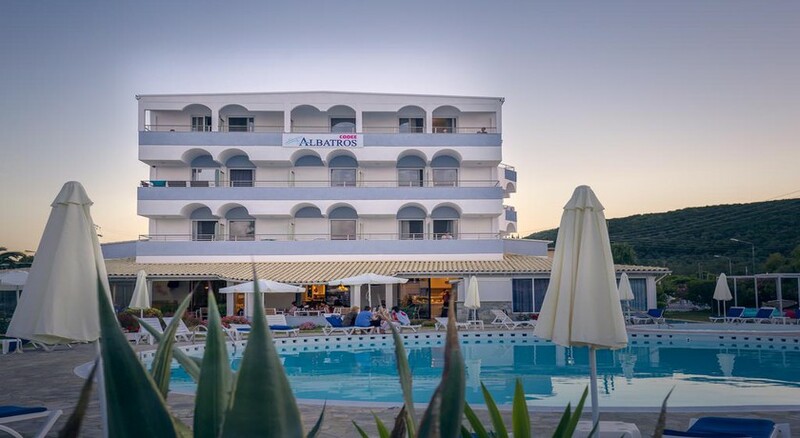 Albatros Hotel is an all-inclusive family friendly hotel in sunny Messonghi, a two km of fine beach and fishing hamlet which is Corfu’s oldest and most picturesque villages. Featuring a swimming pool, pool bar and buffet breakfast, the hotel provides amazing views of the scenic surroundings and invites guests for a comfortable stay amidst warm Greek hospitality. Immaculate, air conditioned rooms at the hotel come with fridge, satellite TV, free Wi-Fi, en-suite bathroom with hairdryer and toiletries. The smiling staff at the reception desk, make guests feel at home. Albatros Hotel is a family friendly boutique hotel in sunny Messonghi, a two km of fine beach and fishing hamlet which is Corfu’s oldest and most picturesque villages. The nearest airfield, Corfu International Airport is 18 km away while the Corfu Town is at 17km. The traditional villages of Clomos, Aghios Dimitrios and Aghios Mathaios perched high in the mountains, with old beautiful churches, chapels, monasteries are also a short drive away. The hotel also provides car rental and free private parking is provided on site. Albatros Hotel offers 78 spacious and bright rooms spread over four floors to suit the requirement of space and taste of guests. The immaculate, air conditioned rooms at the hotel come with fridge, satellite TV, telephone, en-suite bathroom with bath amenities and hairdryer. There are balconies providing magnificent views. 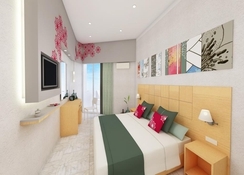 There are larger Family Rooms for large groups or families. Albatros Hotel serves a sumptuous buffet breakfast in the restaurant. Lunch and Dinner comprising authentic Greek dishes can be ordered in the restaurant. Packed lunches are available upon request. Guests can with an exotic cocktail in the Main, Verandah or Pool bar. Albatros Hotel has a bistro at the beach and a pool where guests can soak up can soak up all the sun. Body treatments, manicure and beauty treatments are available on request. The hotel offers diving, bicycle rentals and cooking shows. Watersports are available at the beach. There is lively entertainment such as Music night, Greek night, Magic Show, Fakir and Fire Show at the hotel on a regular basis.